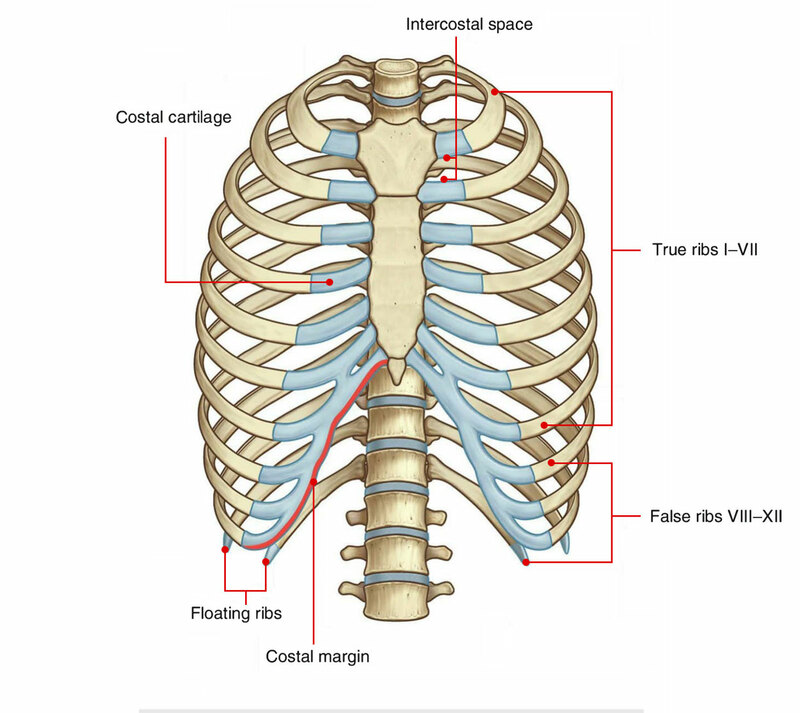 The Intercostal space (ICS) is the space in between the two adjacent ribs. There are 11 intercostal spaces on each side, each intercostal space is numbered for the rib superior to it. 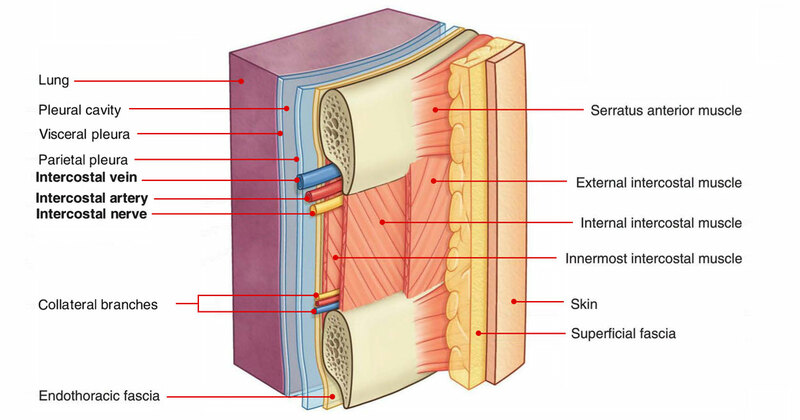 Every space consists of intercostal muscles and neurovascular bundle of intercostal plane. In each space, the vein is the most superior structure and is thus highest in the costal groove. The nervovascular bundle is in such a an order that vein is at the top, then the artery and then the nerve and they are generally not guarded by the groove. For that reason, the nerve is the structure which is in most danger when objects perforate the upper part of an intercostal space. Small collateral branches of the major intercostal nerves and vessels are often found above the inferior rib below. Deep to the intercostal spaces and ribs, and separating such structures from the underlying pleura, is a layer of loose connective tissue, knowned as endothoracic fascia, which consists of variable amounts of fat. Superficial to the spaces are deep fascia, superfcial fascia, and skin. Muscles related to the upper limbs and back overlap the spaces. The blood supply and nerve supply of 3rd-6th intercostal spaces is restricted only upto the thorax as a result of which these 3rd-6th spaces are typical intercostal spaces. Intercostal spaces contains three intercostal muscles, viz. External intercostal, Internal intercostal and Innermost intercostal (intercostalis intimus). The 12 pairs of thoracic spinal nerves intervates the thoracic wall. When they leave, the intervertebral foramina they split into anterior and posterior rami. The anterior primary rami of upper 11 thoracic spinal nerves (T1-T11) are named intercostal nerves as they course via the intercostal spaces. The anterior primary ramus of the 12th thoracic spinal nerve runs in the abdominal wall inferior to the 12th rib, therefore it is known as subcostal nerve. Distinct features: The intercostal nerves are anterior primary rami of thoracic spinal nerves. They are segmental in character unlike the anterior primary rami from other regions of spinal cord which create nerve plexuses viz. cervical, brachial, lumbar and sacral. 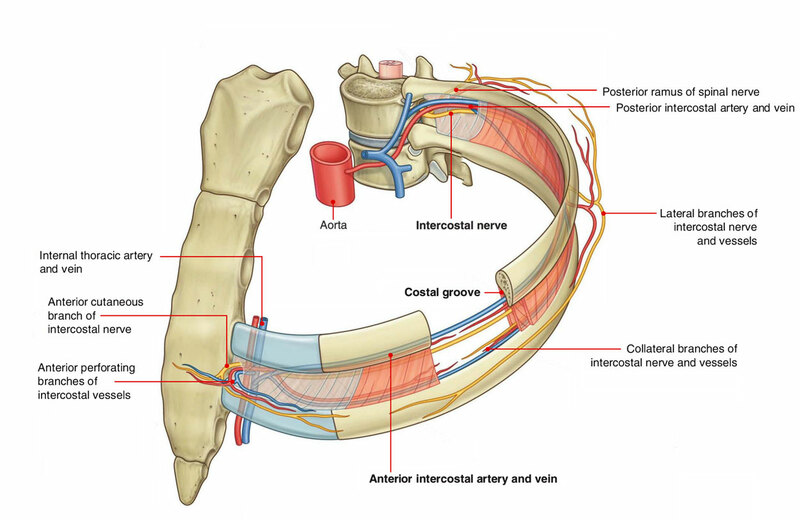 The intercostal nerves are categorized into the following two groups: 1. Typical intercostal nerves (3rd, 4th, 5th, and 6th). 2. Atypical intercostal nerves (1st, 2nd, 7th, 8th, 9th, 10th, and 11th). The typical intercostal nerves are those which remain confined to their own intercostal spaces. The atypical spinal nerves extend beyond the thoracic wall and partly or entirely supply the other regions. The thoracic wall has rich blood supply. It is provided by the posterior and anterior intercostal arteries. 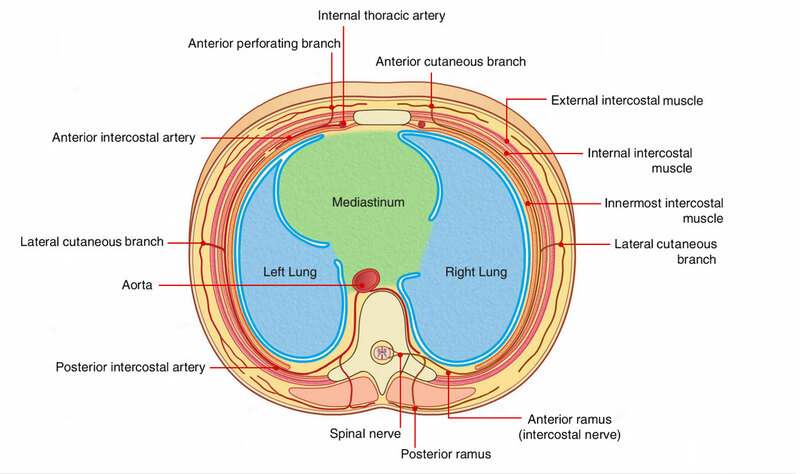 Each intercostal space contains one posterior and two anterior intercostal arteries (upper and lower). There are 11 pairs of intercostal arteries, one in each space. They supply the greater part of the intercostal spaces. There are two intercostal arteries in each intercostal space. They are present in the upper nine intercostal spaces only. The number of intercostal vein corresponds to the number of intercostal arteries, i.e., each intercostal space contains two anterior intercostal veins and one posterior intercostal vein. Their tributaries correspond to the branches of the arteries.